There’s a lot of Japanese animation out there. For a long time I had felt that Hayao Miyazaki was the pinnacle. However, during the last few years I’ve discovered others that share space on the top of the mountain of animé. 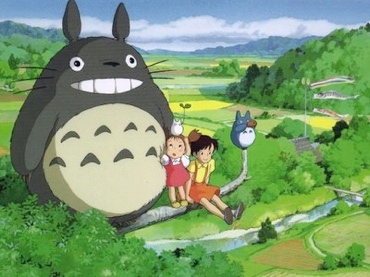 Whether created by Miyazaki or not, these are worth watching over again! This is a growing list, in alphabetical order of titles. I plan on writing additional articles for other animé I’ve seen — several good, several just “meh,” a few dreadful — but here I cover just the ones I consider the best. What are your favorite animé? Either movies or television series. Note the 1st: In addition, I have included links to Wikipedia, Nausicaa.net, Animé News Network (ANN), or official sites, where available. They provide more screenshots which give a better idea about each work’s visual style. But do keep in mind that these sources, especially some at Wikipedia, might include spoilers. Note the 2nd, on maturity levels: All of these are fine to watch for adolescents on up, IMO. Totoro is probably the only one that’s acceptable for all ages including young tads. Just so’s you know. 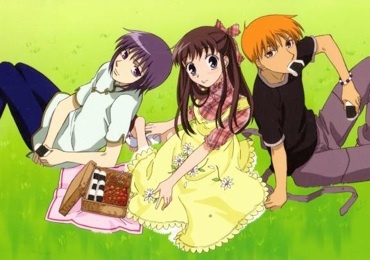 Fruits Basket (TV series). ANN link | Wikipedia link. I avoided watching Furuba for a long time, with its extremely cute yet simple style. But I kept seeing positive reviews at Netflix and other animé review sites, so I finally thought, “Oh, it couldn’t hurt to sit down with the first disc of episodes.” Talk about deceptive appearances! Also, a deceptively clichéd supernatural soap opera plot: recently orphaned Tohru falls in with the cursed (and highly dysfunctional) Sohma clan. Yet the characters have depth, and the story is involving and heart-wrenching. After watching the animé, I got hooked on the manga. The manga hadn’t finished by the time the TV series completed. So the animé takes a subset of (and minor liberties with) the plots from manga, but still results in a very satisfying story nonetheless. 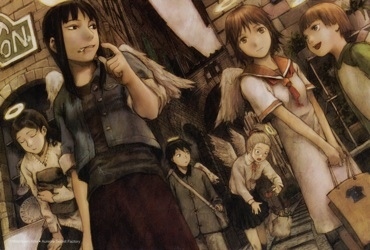 Haibane Renmei ( Grey Wings , TV series). ANN link | Wikipedia link. The opening scenes set the tone for this series: A girl quietly falls to earth, accompanied by a crow. She then wakes up, falling (again) out of a giant egg sac. She finds herself in a quiet (again) old building, surrounded by other young adults and children. Who have halos. And wings. It’s a charmingly low-key, yet rich fantasy about self-discovery, without explosions (except for festival fireworks), and without overwrought battles (except for the thoughtful, internalized kind). I love Yoshitoshi ABe’s moody illustration — it’d be great if the manga for this series became available in English. His dark style is also evident in the ground-breaking Serial Experiments Lain. Reki and Rakka, surrounded by the rest of their gang. Juuni Kokki ( The Twelve Kingdoms , TV series). ANN link | Wikipedia link. 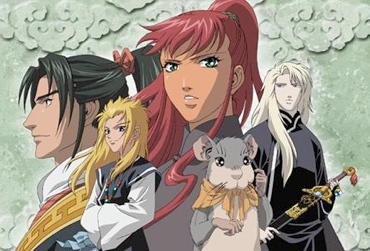 If you want a great epic, watch The Twelve Kingdoms . It’s a whopping 10-disc set, covering the struggle and growth of both empires and individuals. Take a look at one of the protagonists, Yoko: she’s shy, withdrawn, and just wants to conform to everyone’s expectations so she can get by in life. Thrown into a terrifying new world, she learns that she must behave and become the opposite, not just to survive, but to succeed. The world of the twelve kingdoms is itself dynamic and intricate, filled with a wide variety of beasts and people. Yoko, surrounded by Shoryu, Enki, Rakushan and Keiki. 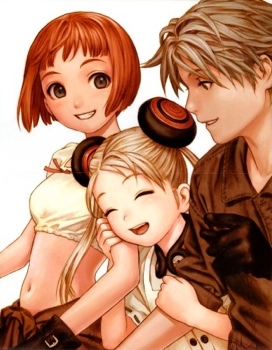 Last Exile (TV series). Official US site (requires Flash) | ANN link | Wikipedia link. 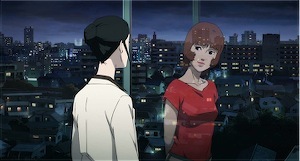 This animé is characterized by a gorgeous steampunk style, using a combination of traditional and computer-generated animation. (Studio Gonzo also made Blue Submarine Number 6 , which I found underwhelming; this is the superior product. Another bit of trivia: Makoto Kobayashi, creator of the superbly hilarious What’s Michael manga, did some of the artwork in this piece. Evidence of high quality, sez I.) It’s about Claus and Lavie, a couple of delivery kids who live where a war has been raging on for longer than their lives. What happens when they run into the eccentric crew of the warship Silvana? What happens when they must deal with the deadly hyper-technologized Guild, or the mysterious little girl Alvis that so many people seem to be after? 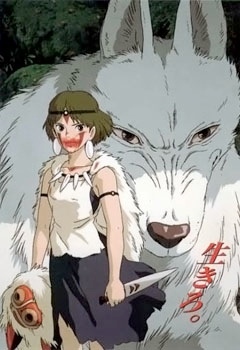 Mononoke Hime ( Princess Mononoke , feature-length film). Nausicaa.net link | ANN link | Wikipedia link. It’s medieval Japan, and a young man must go on a journey to find the source of his curse. What he finds are angry gods, a dying forest, an ambitious industrialist, and a young woman raised by wolves at the center of it all. What might seem to be a clear environmentalism vs. progress issue turns out to be far less black and white than you’d expect. True to Miyazaki fashion, even the most brutal of characters — and there are several — displays compassion and concern for others. As you can tell from the thumbnail below, this film is not for the squeamish. Mononoke Hime with her mother, Moro. 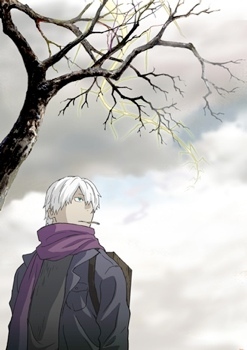 Mushi-shi (TV series). ANN link | Wikipedia link. This is another quiet, yet fascinating series. The mushi are another life-form, kind of like a spirit, kind of like a plant, kind of like an animal. Like us, they live, evolve, and have a need to survive. Ginko the mushi-shi (an expert on mushi) travels around rural Japan, studying and attempting to cure mushi infestations. This animé consists of standalone stories, rather than a single overarching plot — but the beautiful scenery and sense of (quasi) scientific inquiry result in a dream-like admiration at Ginko’s adventures. Ginko the Mushi-shi, with mushi overhead. My Neighbor Totoro (feature-length film). Nausicaa.net link | ANN link | Wikipedia link. When I first watched this movie, it was without subtitles and without dubbing. But with the tones of voice and body language, it became a delight to follow. It’s a typical fairy tale, shown in a way that makes anyone (regardless of age) experience childhood wonder: Two sisters, their absent-minded professor of a father, their ailing mother, and a rickety old house and forest full of spirits to discover. I also view this film as my introduction to Shintoism, although I admit I don’t know how accurately the religion was portrayed. It was, at least by my skeptical standards, a pleasant exposure (i.e., non-evangelical, non-dogmatic). Totoro with Mei and Satsuki, and his cute minions. 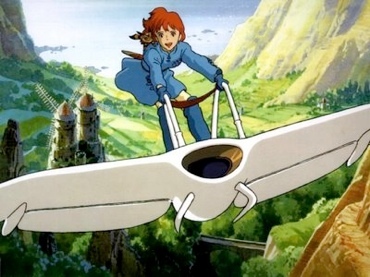 Nausicaä of the Valley of Wind (feature-length film). Nausicaa.net link | ANN link | Wikipedia link. This is the one. After years of self-mockery at my toddlerhood of Speed Racer and avoiding animé, Miyazaki’s first feature-length movie was my gateway animé. (Thanks due to Kam, for her post-college influence!) Characters so fascinating that villains are never as thinly developed as you’d expect. A post-apocolyptic story that challenges the ideas of war and the ecological status quo. To see where a film (animated or otherwise) succeeds where so many fail, watch this one. I also strongly recommend reading the multi-volume manga based on this film, whose plot and characters are both broader and more complex, given the longer production history. It comes as no surprise that it’s one of my favorite manga. Paprika (feature-length film). Please refer to my longer entry on this movie. This was written by sairuh. Posted on Tuesday, December 23, 2008, at 4:40 pm. Filed under Library. Tagged anime, movies, recommendation, review, tv series. Bookmark the permalink. Follow comments here with the RSS feed. Post a comment or leave a trackback.